Fertility differentials were measured in a semi-urban community of Pondicherry, South India. 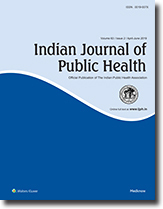 Data of the childbearing population, 15-44 years, and the total number of births and deaths and under age 5 children in 1978 and 1982 of the field practice area of the Jawaharlal Institute Urban Health Center (JIUHC) were taken into account. In Pondicherry, the crude birthrate was 32.6/1000 in 1978 and 25.9/1000 in 1982. When the age-specific fertility rates of the 2 years were compared, there was not remarkable difference except for the age group 15-19 years; the age-specific fertility rate was 405.0 in 1978 and 302.0 in 1982, a favorable trend. The total fertility rate was 4.69 in 1978 and 4.28 in 1982. In 1978, the crude rate of natural increase was 15.1; it dropped to 13.6 in 1982. This attempt to measure fertility differentials was useful to assessing population growth and the impact of family welfare services. The data suggest that the population has been inclined to use the family welfare programs.